← Wind power costs up to ten times more! Climate change “Fastest in Earth’s history”? Nonsense! Bill McGuire is described in the Daily Telegraph as “Professor of Geophysical and Climate Hazards” at University College, London. It occurs to me that his job title rather begs the question of whether or not we face any significant climate hazards. If you hold the Chair of Climate Hazards, you might well be inclined to believe in them, and — who knows — you might be motivated to study them in a less than wholly dispassionate way. But let that pass. Professor McGuire is reported as saying, first that climate change is likely to cause earthquakes, “volcano storms” (whatever they are) and tsunamis. He is also reported as saying: “The speed of today’s climate change is unprecedented in Earth’s history”. I hesitate to call the good Professor a liar, but it is difficult to understand how he would not know that this statement is quite simply preposterous, and utterly untrue. Given that his Chair implies an alarmist approach to climate, it may also be regarded as self-serving. What does he mean by “today’s speed of climate change”? Professor Phil Jones of the University of East Anglia Climatic Research Unit is on record as saying “There has been no significant warming in the last fifteen years”. The general consensus seems to be that climate has been broadly flat in this period. Some analyses suggest a slight decline. Does he mean the last hundred years? In that time, mean global temperatures have risen by around 0.7 degrees C. That too is very modest. Far from being “unprecedented”, it is commonplace. It is broadly comparable with the same stage in the Roman Optimum a couple of thousand years ago, and the Mediaeval Warm Period a thousand years ago. Professor McGuire must surely be familiar with the Bond Cycles , which have shown fluctuations on this sort of time scale throughout the current Interglacial. The slight changes we have seen in the last couple of hundred years are entirely consistent with natural, well-understood and well-documented climate cycles, and require no special anthropogenic explanation. After the Little Ice Age, we now seem to be moving into a new 21st Century Optimum — and we should be glad of it. Generally human societies do better in warm periods than in cool periods. 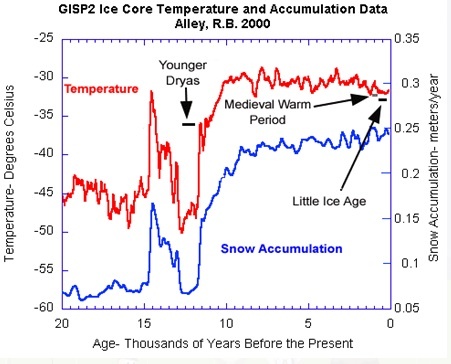 Surely Professor McGuire must be familiar with the Younger Dryas at the onset of the current Interglacial, around 12,000 years ago, when a climate fluctuation of 10 degrees in a decade was recorded in the ice cores from Greenland, with evidence of similar, if less pronounced, changes in other locations? This is reported by the National Climatic Data Centre of the US government amongst others. In the Younger Dryas, we have an example of dramatically more rapid, natural climate change than we see today, and that’s in the last 15,000 years — geologically recent. Yet Professor McGuire says that today’s modest rate of climate change is “unprecedented in Earth’s history” — that’s the last 4,500 million years! Then we come to his predictions of earthquakes and volcanoes. At the beginning of the current interglacial (and presumably of previous interglacials) we had a dramatic loss of ice cover, as the ice melted and the glaciers retreated, and sea level rose rapidly (flooding the Straits of Dover and cutting Britain off from the continent, for example). That was of course associated with a certain amount of seismic activity. But to compare today’s minor changes (sea level changing millimetres a year, if at all) with the beginning of the Interglacial, when sea levels rose hundreds of feet, is bizarre. 7 Responses to Climate change “Fastest in Earth’s history”? Nonsense! There is a major volcano in Iceland which is about to burn through its glacier cap and cause airline (and maybe economic) havoc in Northern Europe. I believe this is the Climate Alarmist’s last ditch attempt to regain the initiative – if they make lots of obscure statements about climate change causing volcanic eruptions and earthquakes, they hope they will be well positioned to pounce on the big one when it happens in the next year or two. I can feel the ground moving under the Professor’s feet! I read the Telegraph’s piece on this; part of a presentation at the Hay Festival. To assess his motives I would really like to know more about McGuire’s audience; presumably he was speaking to the willingly – even enthusiastically – gullible. At the same time McGuire must know from history that the bigger the lie, the more likely it is to be believed. P.S. It occurs to me that if Professor McGuire is seriously concerned about climate hazards, he should be warning about the forthcoming end of the current Interglacial, dramatic cooling, widespread glaciation and a mile of ice over Glasgow. Now that would be a climate catastrophe. No dinosaurs dying out yet then. As the SS Anthropogenic Global Warming, badly holed, starts its final slide into the abysmal and forgotten depths, the voices of those trapped on board become increasingly shrill. But, as ever, our starvation is not the Eurocrats’ problem.